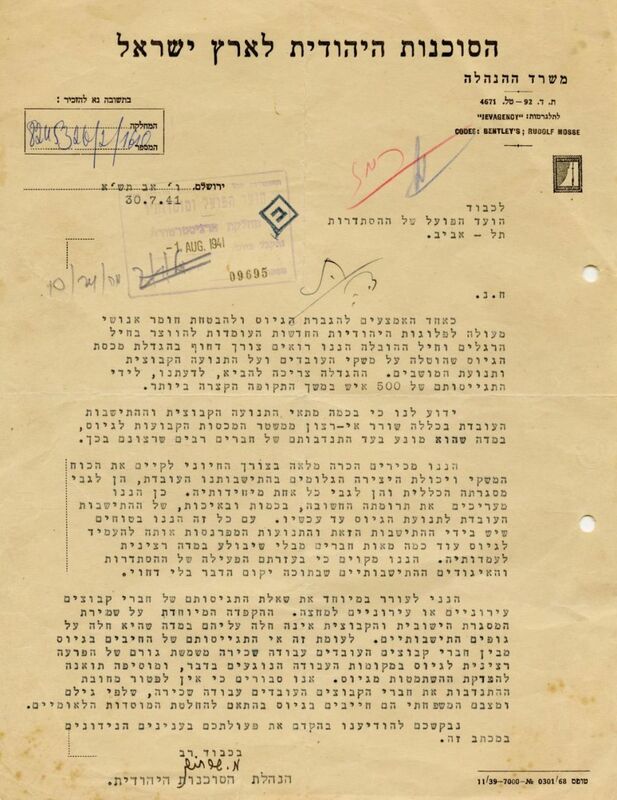 Letter to the Vaad HaPoel of the Histadrut signed by Moshe Sharett in which he demands an increase of the percentages of the draftees from the kibbutz movement to the new Jewish companies in the infantry and transport corps. 30/7/1941. Sharett complains in the letter about the kibbutz movement's general lack of willingness to participate in the quota of regular recruits to the Jewish companies with their claim that the kibbutzim are filling their obligation of "settlement work" and if their members are recruited to the companies, this will harm the settlement. As for Sharett, he claims that this is incorrect, and that there are sufficient members to establish the settlement even if the percentage of draftees goes up. He also complains that the low percentage of draftees in the kibbutz movement causes weakness in other places of work and actually causes widespread draft-dodging. Stencil print with Sharett's handwritten signature. leaf official paper of the Jewish Agency. 20x25 cm. Perforation holes. Very fine condition.